The Macallan Edition No. 1 is the debut expression in the Edition Series. It celebrates The Macallan’s unparalleled oak cask management policy that oversees the entire process from wood sourcing, to finished, seasoned cask. 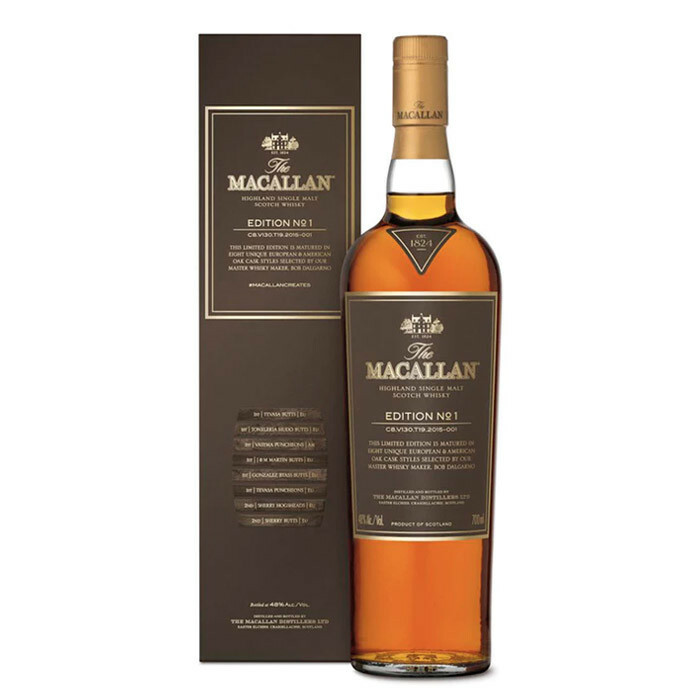 It also showcases the profound influence of The Macallan’s exceptional oak casks into the flavor of the whisky. The result is a bold single malt drawn from eight of the finest European and American oak cask styles and sizes, sherry-seasoned and aged to perfection before being combined to create this rich and multidimensional whisky. The character of each cask style lives within the whisky, creating a taste journey that begins with soft oak notes and takes one’s palate to deeper, richer flavors. When married, these casks bring together a distinctive flavor profile that highlights The Macallan’s complexity and diversity. Bottled at a higher strength of 48% ABV for a fuller, richer flavor. Nose: Orange, apple and dried fruit notes highlight a vibrant and rich aroma. Vanilla, toffee and chocolate underlay oak overtones. Palate: Meandering, warming, wood spices open up to reveal nutmeg, cinnamon, hints of dried ginger and toffee. The fruit appears later - fresh and balanced with fresh oak.